Eyes are one of the most beautiful and powerful components of the human body. According to common knowledge, they are our window to the outside world and they have the ability to express our inner emotions. With our eyes, we are able to communicate our deepest feelings and emotions. The colored part of the eye is called the iris, which contains pigmentation that determines our eye color. The eye color is largely determined by variations in the interaction and expression of multiple genes. These genes are responsible for the most dominant and common colors; brown, blue and green. Other eye colors, such as gray, hazel and multiple combinations are not fully understood or explainable at this time. Some scientists and researchers claim the color of the eyes really can predict your chances of having certain health problems. This is the most common eye color in the world, accounting for nearly 55% of the world’s total population. The dark brown color is due to higher concentration of melanin in the iris and is associated with a number of health benefits. People with dark brown eyes may be less vulnerable to certain diseases. They are less likely to develop melanoma of the eye from exposure to ultraviolet rays. They are also less likely to develop age-related macular degeneration. Dark brown eyes also come with its downside. People with dark brown irises are more likely to develop vision-clouding cataracts than people with light-colored eyes. Research conducted at the University of Pittsburgh found that women with dark-colored eyes seemed to experience more pain when giving birth compared with mothers with light-colored eyes. The women with light-colored eyes also had less anxiety, depression, negative thoughts and sleep disturbances than the women with brown eyes. A 1978 study suggests that people with brown eyes had significantly sharper reflexes during certain athletic activities than those with lighter eyes. This is perhaps, one of the most fascinating aspects of eye color related research and athletic abilities. Green eyes are beautiful to behold. They are also extremely unique and very rare. Roughly 2% of the world’s population have true green eyes. 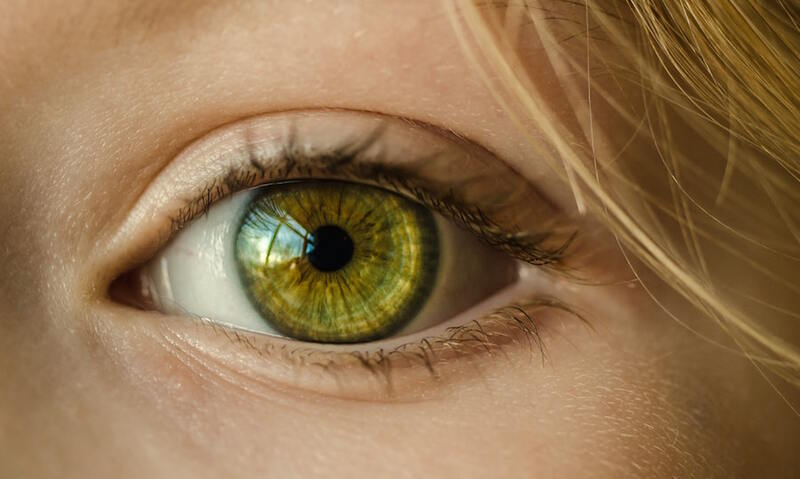 Women with green-colored eyes may exhibit a higher tolerance for pain, and lower risk of anxiety and depression, particularly during labor and after childbirth, according to the American Pain Society (APS) study. Green iris also contains less melanin than dark iris, which provides less protection from ultraviolet rays, which means a higher risk of eye melanoma. According to researchers at the University of Copenhagen, blue eyes are believed to have resulted from a genetic mutation in a single individual from Europe 6,000 to 10, 000 years back. Recent studies have shown that blue eye color is associated with a greater risk of age-related macular degeneration, and a rare but potentially deadly form of eye cancer called uveal melanoma. This is because the blue eyes contain less melanin than brown, green or hazel eyes, making them easily susceptible to damage from ultraviolet rays and blue light. Research also suggests that blue eyes are associated with an increased risk of alcohol dependency in drinkers. A study published in American Journal of Medical Genetics, Part B: Neuropsychiatric Genetics found that European Americans with blue eyes had up to 83 percent higher odds of becoming dependent on alcohol, compared with matched controls who had darker eye colors. Hazel eyes are a bit of a mystery. This particular eye color is hard to define by most people. This is because the hue itself seems to change, depending on the color of your clothing and the type of lightning. Some say it looks like hazelnut, while others call it golden or brownish green. Just like women with dark brown eyes, women with hazel eyes are more susceptible to pain and anxiety than women with light-colored eyes, according to the APS study. A normal and healthy eye is usually white in appearance. A red eye is common from time to time when the blood vessels in the eyes dilate and this may be due to excessive sun exposure, dryness, allergies, dust or infections such as conjunctivitis. A regular and persistent red eye in elderly people is associated with depression. Heterochromia that develops later in life is called acquired heterochromia. Causes of acquired heterochromia include eye injuries, uveitis, and certain glaucoma medications.